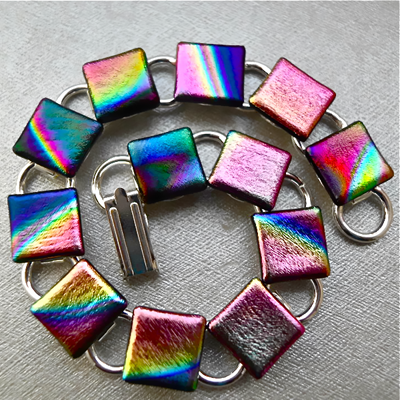 They all come in Silver or Purple card gift boxes. 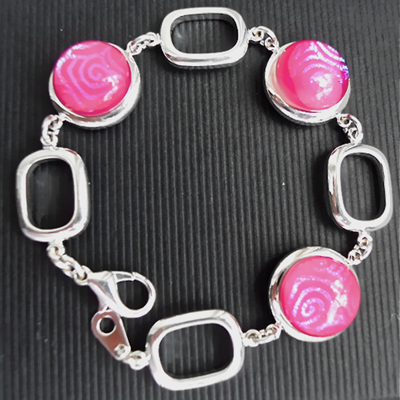 The three round glass pieces are Dusky Pink with Blue patterned Dichroic glass set into a very good quality silver plated bracelet. 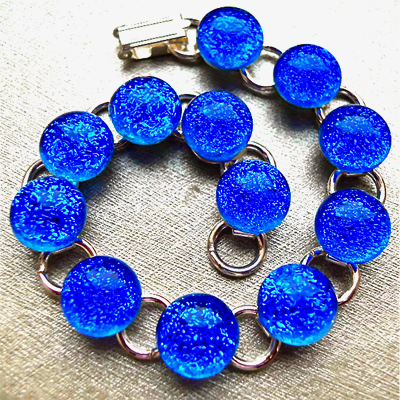 This bracelet comes in a number of different colours. 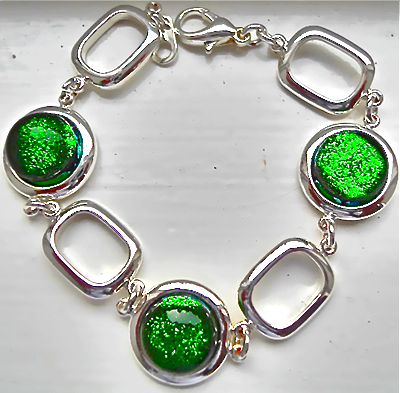 A very pretty slightly heavier vibrant Emerald Green/Purple textured Dichroic glass link bracelet. 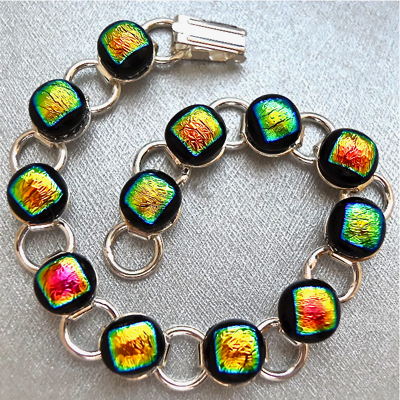 There are matching pendants, rings and earrings. 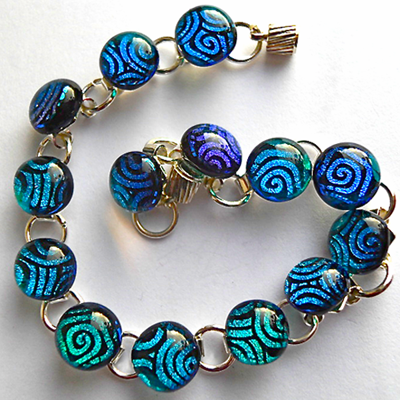 Very colourful bracelet made of 12 square pieces of Teal, Gold, Bronze and a number of other colours Dichroic glass. 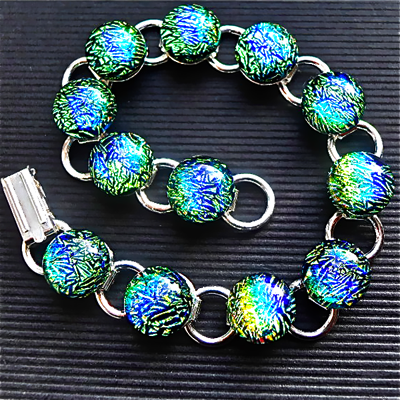 This beautiful sparkly bracelet is made of 12 Green/Blue/Black with a rainbow effect overlay Dichroic glass pieces on a plated silver bracelet. 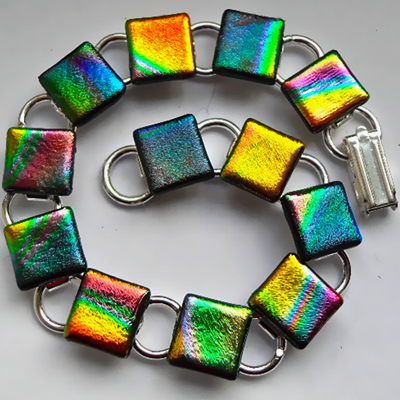 This beautiful bracelet is made of 12 Red, Green and Gold Dichroic glass pieces. There are matching earrings. 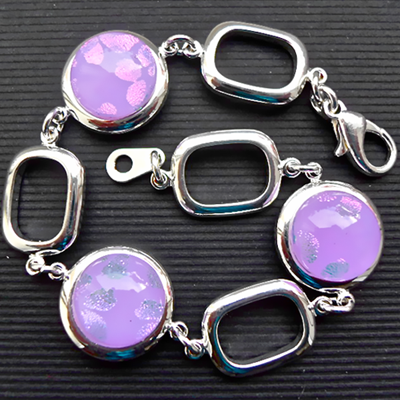 The three round glass pieces are pale Lilac with a pink flower design Dichroic glass set into a very good quality silver plated bracelet. 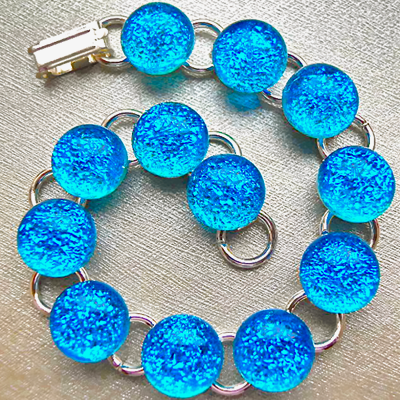 It comes in a number of different colours. 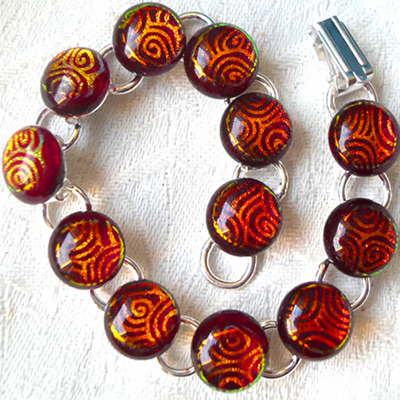 Another new design bracelet. 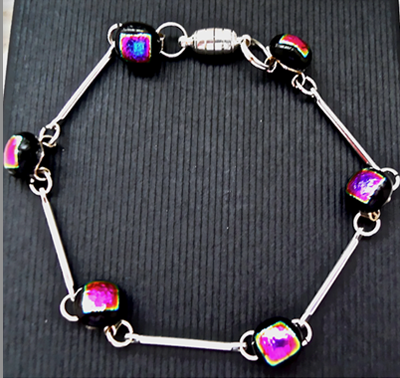 Very delicate with six Black and Pink glass pieces linked with five slender silver plated connectors. 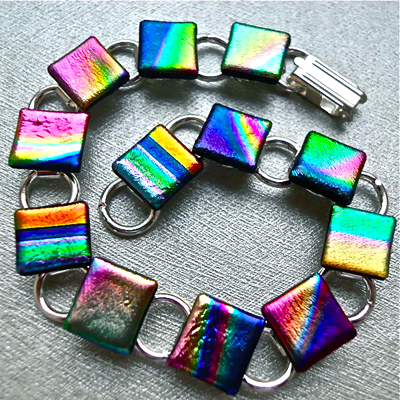 Very colourful bracelet made of 12 square pieces of Pink and various rainbow colours patterned Dichroic glass. 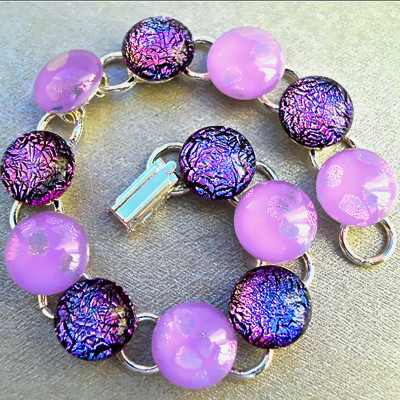 This beautiful sparkly bracelet is made of six Purple/Black and six Pale Lilac with a irridescent flower design Dichroic glass pieces on a plated silver bracelet. 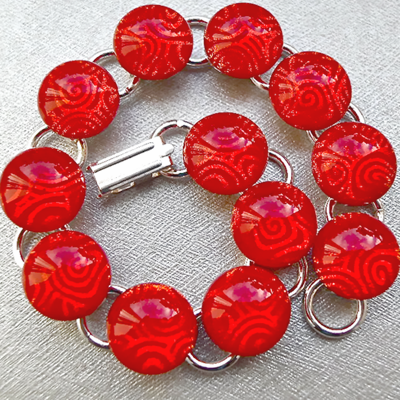 This beautiful bracelet is made with 12 shimmery Red with a Gold pattern Dichroic glass pieces. It has matching stud earrings. 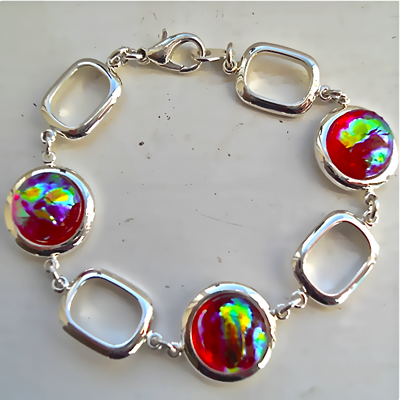 The three round glass pieces are Red with a Green/Gold accent glass set into a very good quality silver plated bracelet. 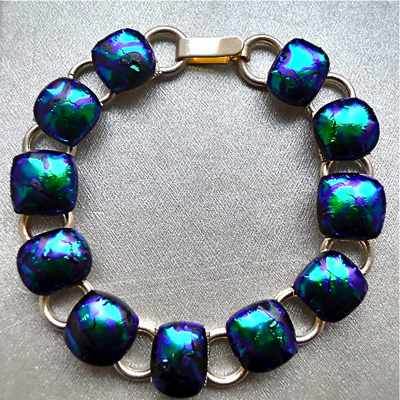 This bracelet comes in a number of different colours.